The Braun Series 7 was the overwhelming winner in our electric shaver Co-Op, and Amazon will sell you one for $130 today, after you clip a $25 coupon on the product page. 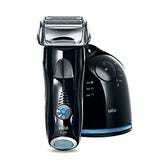 That comes with both the waterproof shaver and the charging/cleaning base station. It’s still an investment, but it would make a fantastic gift, if you just can’t spend that kind of money on yourself. Tri-Ply Cookware Without a Second Mortgage? This Cuisinart Saucepan is Just $37 Today.